Much as we pray together, sing together, break bread and share the cup together, mourn together, laugh together, and celebrate together, so too we support the financial needs of our community together. The money we pledge supports the growth of Westminster's entire ministry, including the cost of outreach mission projects, worship, staff, building operations and programs for children, youth and adults. With our Online Giving feature, you can choose from a variety of installment donation options for your 2019 Annual Giving Pledge, the WPC2020-Forward In Faith (Capital Campaign) gift, a Legacy Fund (permanent endowment) gift, or those one-time donations for special events and fundraisers. Click on Give Online in the Securely Give box to: set up your account profile with automatic payment options or, use the "Quick Give" option for a one-time donation. You will have flexible payment options: either with an eCheck, or a debit card or credit card. Once you select your payment method, you will choose from a drop down list, the appropriate fund for your donation. Your information is held securely by an SSL encrypted connection and will remain private. You can also contribute with a stock donation. If this is of interest, we have specialists able to assist you. Please contact the Office at 415-383-5272 or, email: for more information and the appropriate forms. If you shop with Amazon.com, you can have a portion of your purchases go to support Westminster by going to www.smile.amazon.com and setting up Westminster as your recipient. We thank you for your faithful generosity. Labor day is in the rearview mirror, school has begun and the harvest season is upon us. It is also the time of year we kick-off our Annual Stewardship Pledge Drive. Our annual pledges support vibrant worship, diverse and expansive ministries, staff, vital mission and the maintenance of our facilities. So please as you count your autumnal blessings, fill out a pledge card and help us plan and budget for next year's operations and programming. The Session is dedicated to informing our members openly of the financial discussion and decisions made throughout the year. Our financial reports can be found on the Members page under the Financial heading. (under password; please call the Office if you need assistance.) Thank you for your faithful and generous support of Westminster. We invite you to look over these Frequently Asked Questions as you consider your 2019 pledge. WPC's 2019 Stewardship Committee welcomes any additional questions you may have. Please contact the Church Office and we will contact you directly. Q: Why do we need an annual Stewardship drive to raise funds? A: About 75% our annual operating budget comes from the stewardship drive. The money we give supports our entire ministry including various outreach mission projects, building operations, reserves, staff, worship, children, youth, and adult programs. The church counts on your annual pledge to determine our annual budget and program planning. Q: Doesn’t the Presbyterian Church USA support WPC financially? A: No. WPC actually pays the Presbyterian Church (U.S.A.) a fee per member (per capita cost is $35/member.) That money is well-spent supporting denomination-sponsored activities. In our denomination, individual churches support their own budgets. 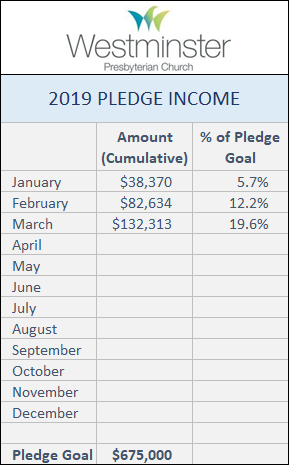 Q: How does the annual pledge drive differ from the recent WPC Capital Campaign? A: The annual pledge drive funds our daily operations and programs. The Forward in Faith Capital Campaign addresses deferred maintenance and necessary safety improvements to our facility including, upgrading our kitchen and classroom spaces, and a more welcoming lobby – all in support of our mission. Q: How much should I pledge? • Give in proportion to your means. Not everyone can give what you can, so think about tying your gift not just to what you think the church needs, but to what you have to offer. • An old tradition in the church is to “tithe,” meaning giving 10% of income. Someone once asked, “Is that before or after-tax income?” If you’re asking that question, you’re on the right track. • Give the gift that gives you joy. You might be surprised how much that is. • Make the church one of your top 3 charities. Many people support multiple organizations. The church depends on you making it a top priority. Q: What types of donations are accepted to honor my annual pledge? A: Donations may be made with cash, check or other liquid assets (such as stock, real estate, etc. ), which may have tax benefits. Contact the church secretary, Diane Masarweh, for more information on making non-cash donations. Q: When and how do I make donations towards my annual pledge? A: Many use our online giving options using a credit card or directly debiting funds from a bank account. Details how to set up your online account are included in your pledge packet. Some prefer putting their regular donation in the offering plate using an envelope so that the gift is recorded against their pledge. Gifts can be made weekly, monthly, quarterly or in a single donation to fit your cash flow and budget. Q: Who decides how the money is spent each year? A: Each fall, with input from Finance and all the Commissions, the Session, our elected elders, carefully considers and approves the annual budget. The budget is presented along with the proposed Pastors’ salaries, to the congregation at the annual meeting in January. The budget is available for review several weeks before the meeting online at: http://www.wpctiburon.org/members/financial/ or from the church office. Q: How much of the budget goes to pay staff/personnel expenses? A: Staff expenses are the largest single component of the budget, typical for most churches. Q: What if my financial circumstances change during the year and I can’t fulfill my pledge? A: A pledge is a commitment, but not a contract. If your finances change during the year, you may need to adjust your giving accordingly. Some people end up contributing more than they pledged, while others may have to cut back when life circumstances dictate. Many of you want to know how we are doing financially. Thank you for your support and generosity to the work of Westminster.